Book Description: This book is a practical guide to adapting or creating open textbooks using the PressBooks platform. It is continually evolving as new information, practices and processes are developed. The primary audience for this book are faculty and post-secondary instructors in Saskatchewan, Canada who are developing, adapting or adopting open textbooks at the University of Saskatchewan. However, there may be content within this book that is useful to others working on similar Open Educational Resource initiatives. 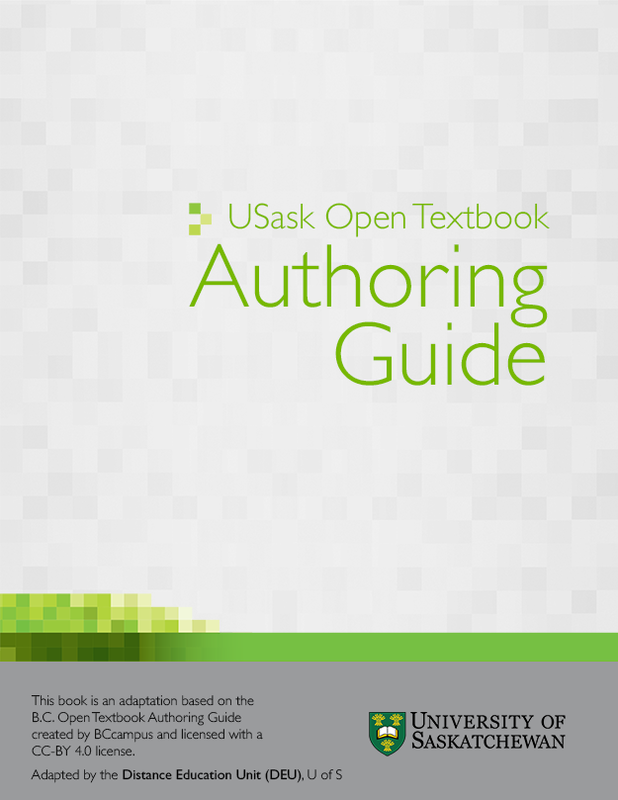 USask Open Textbook Authoring Guide - Ver.1.0 by Distance Education Unit, University of Saskatchewan is licensed under a Creative Commons Attribution 4.0 International License, except where otherwise noted. Jordan Epp, M.Ed., Kristine Dreaver-Charles, M.Sc.Ed., and Jeanette McKee, M.Ed. Changing the references from BCcampus Open Project to be more relevant to the University of Saskatchewan’s open textbook development. Creation of a new title page and book title. Changing information about Support Services to be University of Saskatchewan specific. Performing a general text edit throughout the guide, added image captions, and updated most images to remove the BCcampus branding. Updating Pressbook platform nomenclature to be consistent with the current version of Pressbooks. Unless otherwise noted, this book is released under a Creative Commons Attribution (CC-BY) 4.0 Unported license. Under the terms of the CC-BY license you can freely share, copy or redistribute the material in any medium or format, or adapt the material by remixing, transforming or modifying this material providing you attribute the Distance Education Unit, University of Saskatchewan and BCcampus. Attribution means you must give appropriate credit to the Distance Education Unit, University of Saskatchewan and BCcampus as the original creator, note the CC-BY license this document has been released under, and indicate if you have made any changes to the content. You may do so in any reasonable manner, but not in any way that suggests the Distance Education Unit, University of Saskatchewan or BCcampus endorses you or your use of this work.